Muffins and quick breads are really the same bread baked in different pans. The secret to making a good muffin or quick bread is in the mixing. The batter should be stirred (never beaten) only until the dry ingredients are thoroughly incorporated. The mixture will be rough and lumpy, but this is ok. The remaining lumps will dissipate during baking. If the batter is over-stirred or beaten, the muffins will be small with peaked tops. They may have tunnels running through them with a tough, rubbery texture. The texture and flavor both will suffer from improper mixing. The batter should be placed in the greased pan and baked immediately after mixing. Allowing the batter to stand will result in a loss of leavening and an inferior muffin. 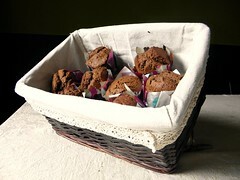 If it is necessary to hold the muffins before baking, place them in the refrigerator for up to 20 minutes. There are two different methods used to make muffins and quick breads: the muffin method and the cake method. The muffin method is easier and produces a coarser, open texture. The cake method produces a finer, more cake like texture. The cake method is normally used for richer muffins containing a larger proportion of sugar and shortening. The two methods follow. The Muffin Method: Sift the flour, baking powder, salt and sugar together. Combine the egg, milk, and melted shortening. Pour the flour mixture into the wet ingredients and stir just enough to moisten the dry ingredients. The Cake Method: For a more cake-like texture cream the un-melted shortening with the sugar, beating until light and fluffy. Add the egg, beat well, then stir in the milk and other wet ingredients. Sift the dry ingredients together and add to the wet ingredients, stirring only until all are incorporated. A sweet muffin that uses the cake method to produce a fine textured cake like texture. Cream shortening, add sugar gradually, beating until light and fluffy. Add egg and beat well. Stir in milk, orange juice, and zest. Add the flour mixture, stirring just enough to moisten the dry ingredients. Do not beat. Fill muffin Tins 2/3 full. Bake at 400 degrees for 20 to 25 minutes. This muffin is a savory muffin that uses the muffin method, combining wet and dry ingredients in one easy step. Do not beat. Sift flour, baking powder, salt and sugar. Add the corn meal, cheese and green pepper and mix well. Combine egg, milk, melted shortening and onion. Pour the wet mixture into the flour mixture and stir just enough to moisten the dry ingredients. Do not beat. Fill greased muffin pans 2/3 full. Bake at 400 degrees for 20 to 25 minutes.